Armed Civilian Kills Gunman, Stops Shooting Spree At Walmart In Washington State, at washingtonpost.com. Another example of a good guy with a gun stopping a bad guy with a gun. The truth is you and I are the “first responders” in every situation. Cops and fireman are second responders. U.S. Announces Its Withdrawal From U.N. Human Rights Council, at npr.org. Many countries on the U.N. human rights council are the biggest abusers of human rights. Excerpt from the article: “Nikki Haley said, “I want to make it crystal clear that this step is not a retreat from human rights commitments. On the contrary, we take this step because our commitment does not allow us to remain a part of a hypocritical and self-serving organization that makes a mockery of human rights.” Can I get an amen? Left Blames Evergreen’s Bat-Wielding Mobs On Anti-Racisim Professor, at thefederalist.com. Progressive leftists can get away with this kind of behaviour. Here is an0ther example that if you are on the politically correct side you can get away with actions that would land other people in jail. Double standard anyone? Her is another article about the social justice cult on Evergreen campus, Weinstein Warns Congress About ‘Cult’ Of Campus Progressivism, at campusreform.com. 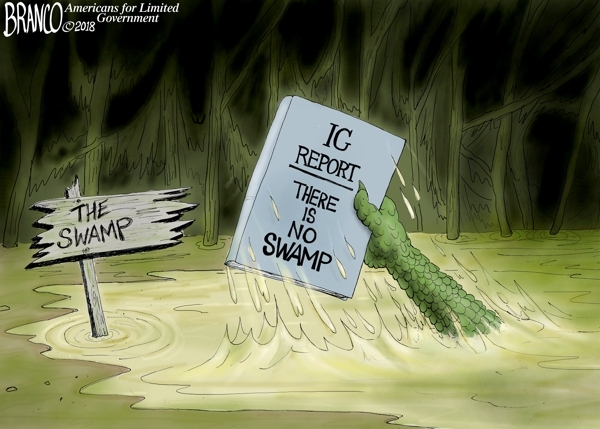 6 Revelations From ‘The Swamp’ Documentary Show Just How Dirty DC Is, at thefederalist.com. ‘The Swamp’ Documentary gives insight on how the DC political game is played. We have to fight back if our country is going to survive as a constitutional republic. Trump is an outsider who is pushing back against the swamp. I love the fact that he is driving progressives in the media and both parties crazy. 50 Media Mistakes In The Trump Era, at sharylatkisson.com. Here is a list of Fake News stories that were used by the progressive left to undermine Trump. Sharyl Attkisson: The Left Invented Fake News, at zerohedge.com. The left invented the term ‘Fake News’ in an attempt to smear talk radio, Fox news and the internet. Trump flipped the script on them. Now ‘fake news’ means the main stream media. Ultimately it is up to us to figure out what is fake news and what is reality. Don’t trust anything you hear or read. Figure out the truth for yourself. Rachel Maddow Breaks Down During Report On ‘Tender Age’ Shelters. “…and the Emmy Award for the worst performance by a lead actress in a drama series, or is it a comedy series, goes to Rachel Maddow.” Fake tears to promote fake outrage in an attempt to make Trump look bad. Watch IG Horowitz Reaction When Asked If Hillary Committed “No Crimes”, at zerohedge.com. This says it all about whether Hillary broke the law. Hillary is a part of the establishment. And as an insider she got protection from her law breaking. Anyone one of us would be in jail if we did what she did. I have tried to get people to understand the point Comey is making here. Hillary could legally have a private email server. But it was illegal to conduct government business, especially classified business, on her private server. The standard for breaking this law is ‘Gross negligence’. Intent was not the standard. Comey never tried to hide the facts of what Hillary did. What he attempted to do was use verbal sleight of hand to change the standard of prosecution for what she did, from gross negligence to intent. It is that simple. IG Report Confirms Obama Lied About Hillary Email Server, at zerohedge.com. Obama said he learned about Hillary’s email server from the NY Times. But Obama had direct contact with Hillary on her private email account. He used a pseudonym for his username on his government email account. Read this short article. You will be amazed at how corrupt establishment insiders are. Flynn Evidence May Have Been Tampered With By FBI: GOP Lawmaker, zerohedge.com. Corruption in the FBI! Who would believe that? Government agencies have one objective. To protect government power from being rolled back. Political outsiders must be destroyed by all means available. In this case by the legal system. McCain Office Involved In IRS Targeting Scandal; Pushed “Financially Ruinous” Audits Of 501(c) Orgs, at zerohedge.com. Progressives in the Republican party are no different from progressives in the Democrat party. They both want Government power to grow, and individual freedom to shrink. The IRS scandal is a perfect example of establishment insiders attempting to torpedo groups of citizens who wanted to roll back the size and scope of government. “Public servants” want to protect what is in the best interest of their little feifdom. They are not interested in what is in the best interest of the “public”. And what is best for the “public” is individual freedom. What Soros doesn’t understand is that it is not Trumps revolution. People all over the world had finally had enough of government intervening in their lives. Brexit was an example of this and Brexit happened before Trump. Obama tried to interfere in the Brexit election but he couldn’t stop the reality that people were seeing. Establishment insiders created the atmosphere that pissed off enough people, which allowed an outsider like Trump to get elected. The “revolution” is not Trumps, although he is doing his best to get rid of the status quo. When Trump leaves office, the people who voted him in office will still be there. And they will be looking for the next outsider to take the machete and continue hacking away at big government.